Employ machine learning algorithms and generating training data. Developed CNN based model for text classification using Tensorflow. Developed RNN, BILSTM based models for NER detection and Text classification using Tensorflow. Generate words embedding using word2vec, fasttext and glove models. Develop App architecture and provide technical guidance to the team. Optimizing the performance bottlenecks using multi-processing. Generate training data from scratch using advance regexes. Detecting and optimizing the performance bottlenecks. Responsible for full release cycle of the project. Develop the pipelines to enable ML models training on multiple machines and make real time predictions. Responsible for the code deployment on the staging and Production environment on AWS Services. Parsing trip emails for extracting the entities using NLP / machine learning. Developed CNN classification models in tensorflow for NLP problem. Building and managing new features and integrations with third-party services. Developed a natural language multi-turn interactive bot, to be hosted within a distributed Flask-based python web service. The bot service is conversational context and disambiguate references, allowing for multi-turn interactions. Parsing trips emails for extracting the entities using NLP / machine learning. Developed text classification models in tensorflow for NLP problem. Developed the CCN models in tensorflow for text classification problem. Developed the CCN models in tensorflow for image classification problem. Building and managing new features and integrations with third party services. Detecting and optimizing the performance bottlenecks and provide technical guidance to the team. Developed enterprise web app with AngularJS, Django, ElasticSearch and Docker. Architecting and developing web applications in Flask and AngularJS. Building, testing and documenting RESTful APIs. Developed the Android blog app using RESTful API in java. Developed caching engine using Redis.io. Used celery for managing and scheduling background tasks. Developed CI(Travis ci) pipelines for automatic deployments. Used Pytest and Pylint for code testing and pep standardization. Used Docker for developing micros services. Used Docker swarm for sever load balancing. Responsible for coming up with user stories and leading technical meetings in the company. Developed scalable systems with Laravel and codeigniter frameworks. Developed the E-commerce solutions in Magneto. Provide the customized CMS solution in PHP. Blog base CMS in WordPress and Joomla. Developed single page application Used AngularJS and jQuery. Developed Jquery plugins for custom requirements. Leveraged the open source modules i.e. Mailchimp for mailing service and stripe for building payment system. Computing includes developing software systems for a wide range of purposes. 10% of my programming knowledge comes from the University, and 90% comes from Internet, books and work experiences. It’s not often you find someone as passionate about their work as Ikram. I’ve been working on several projects with Ikam, and he’s always been going above and beyond to better meet any expectations. System Management and quality analysis have been a breeze with Ikram, he’s always coming to the table with great ideas for improving on existing processes. Ikram would be a great asset to any team. This is my personal recommendation for Ikram Ali. 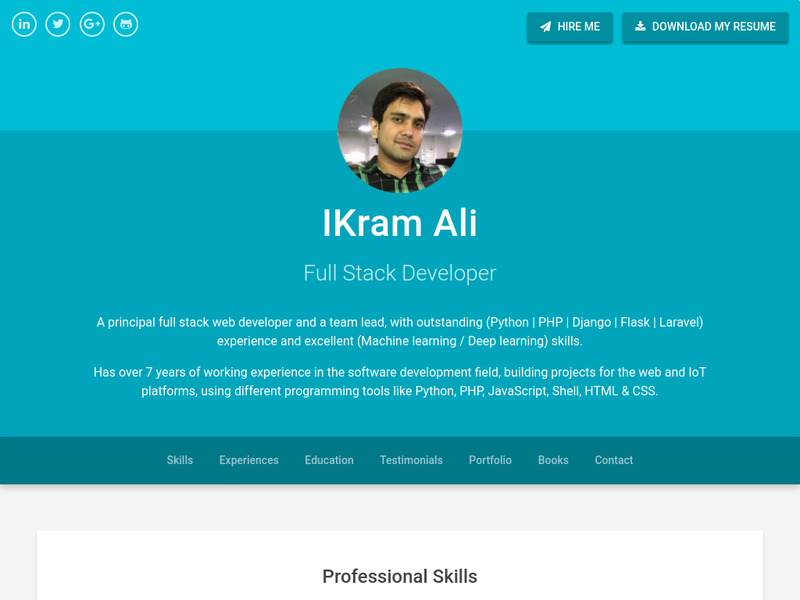 Until just recently, I have been Ikram's team lead for several months. I found him to be consistently pleasant, tackling all assignments with dedication and a smile. His interpersonal skills are exemplary and appreciated by everyone who works with him. Besides being a joy to work with, Ikram is a take-charge person who is able to present creative ideas and communicate the benefits. He has proven that he can be trusted to deliver a completed project on schedule and within budget. I highly recommend Ikram for employment. He is a team player and would make a great asset to any organization. Implementation of the OAuth protocol in PHP. Implement the OAuth protocol to retrieve a token from a server to authorize the access to an API on behalf of the current user. Perform calls to a Web services API using a token previously obtained using this class or a token provided some other way by the Web services provider. Complete Resume based portfolio for developers. I wanted a dev landing page to showcase everything I do online and I wanted it to be minimal and right to the point rather beautiful and hefty. I'm currently taking on freelance work.